The global precast construction market was valued at around US$ 111 Bn in 2017. It is anticipated to expand at a CAGR of approximately 5.1% during the forecast period, according to a new report titled ‘Precast Construction Market: Global Industry Analysis, Size, Share, Growth, Trends, and Forecast, 2018–2026’ published by Transparency Market Research (TMR). The report infers that the use of precast construction reduces the lead time and provides better dynamics such as durability and sustainability to the structure as compared to the use of conventional construction techniques. This is expected to drive the precast construction market during the forecast period. Asia Pacific and Europe are leading regions of the precast construction market. The precast construction market in Asia Pacific is projected to expand at a CAGR of more than 6% during the forecast period, owing to a rise in investments in residential and infrastructure projects in the region. Precast construction saves up to 20% of the total construction time as compared to conventional construction methods. It helps in saving valuable lead time and in reducing the risk of delay or monetary loss in the project, which is expected to boost the precast construction market. The raw materials used in precast construction are inorganic, natural, and recycled resources. Production of precast construction components involves minimal processing or chemical treatment, which results in low embodied energy value (carbon emissions). Thus, a reduction in carbon emission through the precast construction technology is projected to drive the precast construction market during the forecast period. Important parameters such as temperature, mix design, and stripping time are monitored and controlled in a factory environment while producing precast components. A factory-controlled prefabrication environment and elimination of rectification work render high quality and esthetic value to products, thereby augmenting their demand. Precast concrete products are resistant to friction, impact, acid, corrosion, abrasion, and other environmental factors. Precast concrete structures have a longer service life and require minimal repair and maintenance. High structural strength, increased durability, and better rigidity are driving demand for precast construction products. Use of high-quality machinery, equipment, and materials; extensive preproject planning; and high investments in the construction industry are estimated to offer lucrative opportunities to the precast construction market during the forecast period. However, high initial cost and logistical and material handling damages are anticipated to hamper the market. The report presents a detailed segmentation of the global precast construction market based on its structure system and end-use. In terms of structure system, the floor & roof system segment constituted a major share of the global precast construction market in 2017. Floor & roof systems enable a large span capacity besides providing excellent sound transmission and heat resistance characteristics. Moreover, they provide load distribution properties and are ideally used in garages, gymnasiums, paper mills, office & commercial buildings, industrial buildings (food processing industry, paper mills), condominiums, apartments, hotels, educational institutions, sewage & water treatment plants, etc.. They are also used as thermal mass to reduce the need for air conditioning. The floor & roof system segment is expected to expand rapidly, due to the high adoption rate of floor & roof systems in the precast construction market. In terms of end-use, the building works segment is projected to hold a dominant share of the global precast construction market during the forecast period. The segment is likely to expand at significant growth rate from 2018 to 2026. The residential segment, which is a sub-segment of the building works segment, is projected to expand at a rapid pace during the forecast period. Precast concrete construction offers diverse attributes such as low floor-to-floor height, deflection control, low noise transmission, involvement of high-strength materials, and long spans. Such attributes are effective for the residential construction industry. Demand for precast construction products in the residential construction industry is expected to rise due to their direct cost reduction, improved constructional efficiency, and superior structural performance. Asia Pacific and Europe were key regions of the precast concrete market in 2017. The precast concrete market in Asia Pacific is anticipated to expand rapidly owing to cross-border investments and business expansion of companies in high-growth areas, such as India and Southeast Asia. A rise in population, rapid urbanization, and robust economic growth are major macroeconomic drivers of the precast construction market. Regulatory bodies and major firms across the region are encouraging and promoting constructional activities. China is expected to become a key region of the precast concrete market, owing to the revival of the Silk Road and proposals of construction on it. The precast market in Middle East & Africa is also projected to expand at a robust pace. 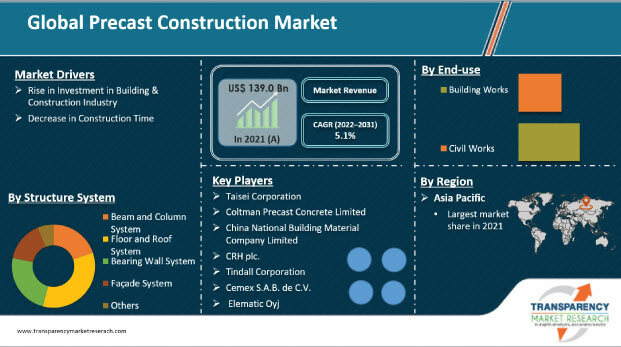 The report also provide profiles of leading players operating in the global precast concrete market such as Bison Manufacturing Limited, Cemex S.A.B. de C.V., China National Building Material Company Limited, Coltman Precast Concrete Limited, CRH plc, Elematic Oyj, LafargeHolcim, Larsen & Toubro Limited., Taisei Corporation, and Weckenmann Anlagentechnik GmbH & Co. KG. These players offer sustainable and durable solutions to clients. Innovation of modern construction equipment and techniques through R&D is one of the approaches adopted by them.